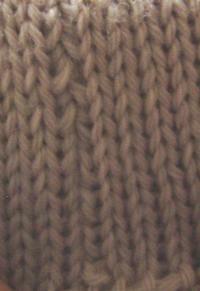 Ok - this herringbone stitch tutorial may not be what you've seen before. It's a combination between the herringbone idea and the edge to edge joining method you may have seen in magazines. For me it works great for stitching up ribs at the bottom of sweaters or even just regular knitting. I love it because it gives a flatter seam than any other method I know, and you'll see by my pictures that, with practice, you won't be able to see the seam at all. Completely invisible! How's that you ask? Read on to discover this amazingly simple technique. There's no seam on that picture, you say! Yes there is - between the 3rd & 4th rows of vertical stitches from the left of the picture is where the seam is. Honestly! You can see for yourself how it's done. Check out the pictures below too. Thread your needle with the tail of yarn. Line up your pieces. Bring your needle through from back to front exactly one stitch (V shape) in from the edge on the first row of the opposite side from the tail. Pull close, but not too tight. On your first piece (where tail comes from), skip one row, then bring your needle from back to front exactly one stitch (V shape) in from the edge on this side. Pull close, but not too tight. Skip one row on the opposite side and bring your needle from back to front exactly one stitch (V shape) in from the edge. Pull close, but not too tight. Repeat last 2 steps until the end of your seam. Turn work over to Wrong Side, stitch over seam edge twice to secure end and weave in approx. 3-4 inches of yarn along Wrong Side of seam. As you can see by the picture at the top of the page the seam is completely invisible and it was worked from the Right Side too. Pretty amazing, I think! I love my version of this herringbone stitch technique for knits as it's so flat and invisible. Superb!